A manual network provides a simple virtualized network without any Skytap Cloud DHCP or DNS services. Manual networks do not support public IP addresses, published services, or Network Address Translation (NAT). To learn more about manual networks, see Network overview. Click Create New Network. The Create network dialog displays. For Network type, select Manual. Enter the Gateway IP address, Subnet, and Subnet size. Gateway IP address – Often, this is the last address in the subnet (for instance, 10.0.0.254 for a /24 subnet). Subnet and Subnet size – The IP address and subnet mask for the network. The subnet size must be between 16 and 30. See Avoiding restricted subnets and IP addresses. The subnet and subnet size are automatically calculated to create the Normalized subnet value. These values are used by Skytap Cloud to ensure proper routing for outbound access to the public Internet and routing with other Skytap Cloud networks. The network settings must match the actual networking you put in place. For example, each VM attached to the manual network must have a unique IP address in this normalized subnet IP address range. Otherwise, the VM networking may not work properly. 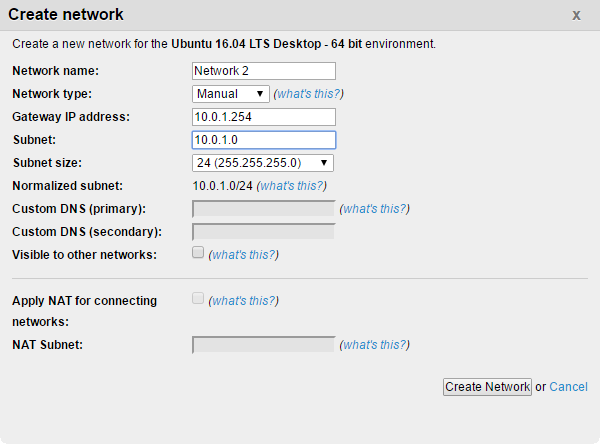 For help determining appropriate TCP/IP networking settings, see Ubuntu Server Guide > Networking. A new network does not have any virtual machines connected to it. To connect VMs to the network, see Attaching VMs to networks.